The Hotel Suite Villa Maria is a dream place, especially for families and golfers. Year after year, guests from all over the world visit us searching for a peaceful, affable and charming space to enjoy a relaxing experience with tailored-made services. Although there are many ways to enjoy the services and facilities of our hotel, we propose the following summary, just like a chronicle, a stay of 48 hours in our Villa Resort. We invite you to join us for a weekend and let yourself be surprised by this great holiday plan. If we take a look at the opinions expressed by Tripadvisor’s users -where Hotel Suite Villa María has been chosen as one of the best hotels for families in Spain-, we will see that one of the details most appreciated by our guests is the glass of champagne with which we welcome them. 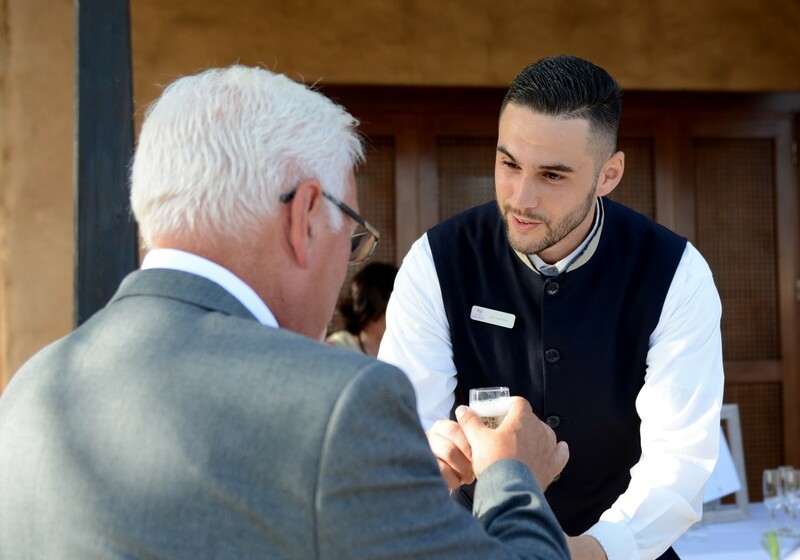 Without a doubt, personalized treatment is one of our main hallmarks of identity and the comfort of our guests will always be our main objective. Our villas are perfectly equipped so that you can enjoy them all day long and not have to leave. This moment of relaxation allows users to enjoy its fantastic features – especially those users who opt for the villas with pool or jacuzzi-. If you have come to spend your holidays with your family, we suggest that you go with your children to our Miniclub to meet our animator “Bea” and the rest of children who have fun day after day with all our activities. But if what you are looking for is to put the best end to your first day at Hotel Suite Villa Maria, you must visit the Restaurant La Torre. We assure you that our kitchen team proposals will make you have a very special evening, accompanied by the best flavors of Canarian and international cuisine. Freshly squeezed orange juice, high quality pastries, fresh fruit, coffee… it is very likey that, when spending a weekend in a hotel, what is most appreciated are the good breakfasts, but we assure you that the flavours and variety you will find in our breafast buffet will be difficult to forget. If you plan to play golf, the best way to start the day is to enjoy a good breakfast. For those who decide to play at Los Lagos (par 33), the 9-hole course that surrounds Hotel Suite Villa María, our Bellboys can drive you down from the hotel to the golf course by buggy. 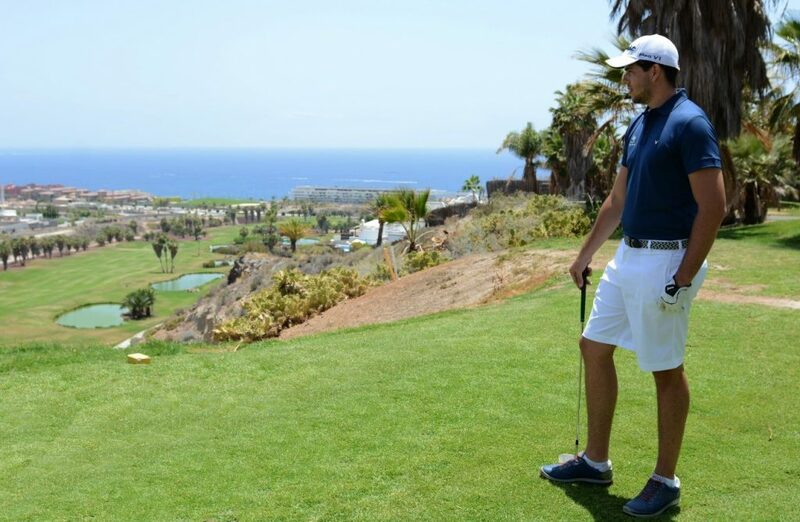 Furthermore, if you wish to try the 18-hole golf course Golf Costa Adeje (par 72), we are located just a few kilometres away. We propose two plans; for the best way to finish a golfing day. If you are interested in getting to know our beautiful town, it is the ideal time of the day to enjoy La Caleta, either by going on a long walk, shopping in the local shops or by watching the sunset together with a glass of wine. On the other hand, if you are exhausted after the whole day out in the greens, there is nothing more refreshing than a nocturnal jacuzzi session. The island’s temperatures will be your big ally for the best moment of relaxation. The weekend is over, but that doesn’t mean you have to stop enjoying yourself. 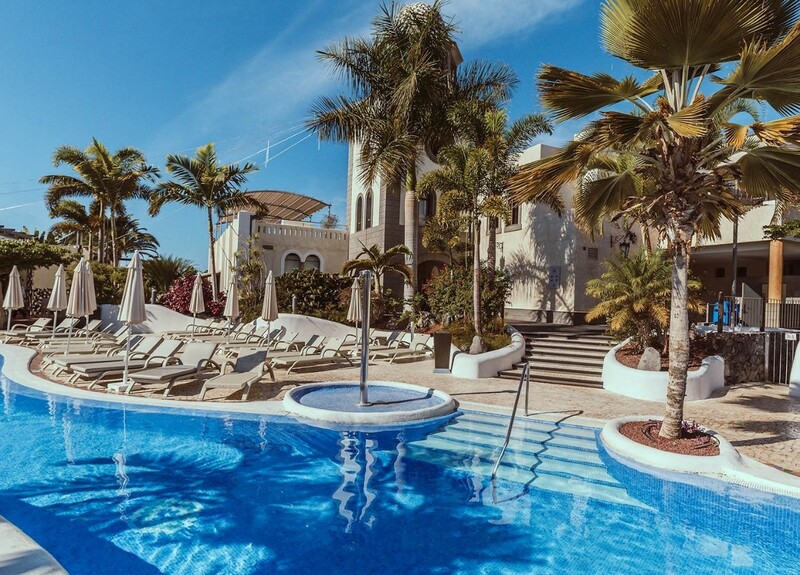 What if you take a dip in one of our pools to say goodbye in style? If you go with your family, you’ll have a great time playing with your children, but if not, you’ll also have enough space to rest and disconnect while sunbathing. Likewise, before the check out, it is almost obligatory to make a stop at our Blue Oasis Pool Bar. Our selection of snacks is wide and delicious, and the atmosphere is a wonderful way to enjoy the last hours of a weekend that – we are sure – you won’t forget. Eventhough the 48 hours at our hotel have come to an end, the Hotel Suite Villa Maria experience continues on our social media networks. We invite you to share all your moments using the hashtag #SuiteVillaMariaExperience and that you rate your experience in the many different opinion portals (Tripadvisor, Google, Booking, Expedia…). We also encourage you to call or write to us if you have any questions or queries. There’s nothing better than keeping in touch with our guests and, of course, knowing that they trust us again and again when deciding their next visit to the south of Tenerife.